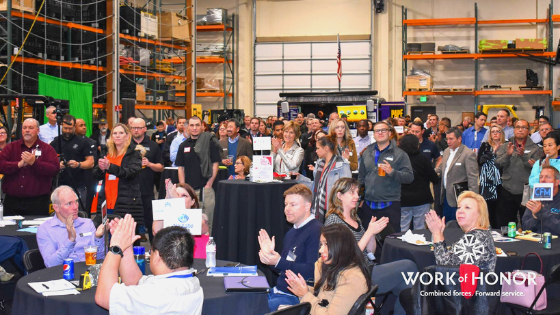 Our Seattle Papé Rents location was proud to partner with Work of Honor to host a hiring event for veterans and military spouses on November 29. Taking place in our very own warehouse, there were over 300 people in attendance with more than 40 company representatives present including Amazon, Macy’s, Google Fiber, Allstate, and of course Papé. Over the course of the night, these representatives interviewed and connected with potential talent for positions within their companies. Several Papé employees conducted interviews for sales, parts, and service roles and ended the night with 10 additional candidates to follow-up with. Throughout the month of November, our King County Papé locations and Work of Honor also collaborated with the Marine Toys for Tots Foundation to drop off, pick-up, and store boxes for hundreds of businesses donating toys to children in need. Our Papé employees collected more than 150 full boxes throughout this time, with 4 boxes filled the night of the networking event alone! The Toys for Tots results will be shared at the KIRO Cares event on December 7th from 6:00 A.M. to 6:00 P.M. This partnership with Work of Honor began back in 2014 and has been a natural fit from the start; thanks largely in part to how closely both companies driving principles align. Work of Honor is committed to creating a strong economic community through best in class business and military operational strategies and Papé is dedicated to providing End to End solutions that not only keep our customers moving but the community as well. This focus on serving the community has primarily occurred through volunteering time and resources, while also participating in monthly recruiting events over the last four years. The November 29 event marked the first recruiting event held at a Papé location. From the food, which was provided by a local veteran catering company, to the participating companies and U.S. Marine volunteers from King County, the night was a resounding success, leaving many attendees saying it was the best Work of Honor event they had ever attended. We would like to thank all the teams from King County, and surrounding areas, for making the networking and Toys for Tots events such a success and providing wonderful service to their communities.